It seems like a no-brainer. Make uranium burn stronger, hotter and longer in nuclear reactors, and you'll need less fuel, and there'll be less waste to deal with when it has been exhausted. For decades, nuclear operators have done just that, but emerging safety and waste-disposal issues are raising questions about this approach. The latest high-efficiency fuel may prove to be unstable in an emergency, and so poses a greater risk of leakage of radioactive material into the environment. What's more, the waste fuel is more radioactive, meaning it could prove even more difficult than existing waste to store in underground repositories. To boost the efficiency of their reactors, operators have progressively enriched the uranium they use as fuel to increase its "burn-up" rate. This is a measure of the amount of electricity extracted from a given amount of fuel, and is expressed in gigawatt-days per tonne of uranium (GWd/tU). The higher the burn-up, the longer the fuel rods can remain in the reactor. This has proved particularly successful in the pressurised water and boiling water reactors commonly used in the US and elsewhere. 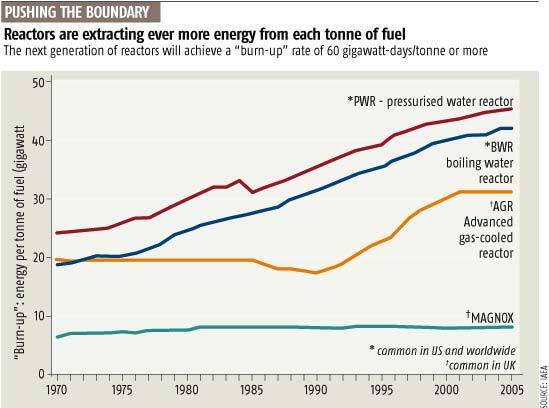 Since 1970, the average burn-up of these reactors worldwide has almost doubled, to more than 40 GWd/tU (see graph below). The next generation of nuclear plants will bring a further step-change. Applications for the construction of 30 reactors in the US and 10 in the UK are expected over the next few years, and plans for the two designs most likely to be built - Westinghouse's AP1000 and Areva's European Pressurised Reactor - envisage burn-up rates of 60 GWd/tU or more. At these rates, uranium fuel rods should burn for around a year longer than today's best burn-up fuel. Such gains may come at a price. Last month, at conferences in Washington DC and Rockville, Maryland, organised by the US Nuclear Regulatory Commission (NRC), a team led by Michael Billone at Argonne National Laboratory in Illinois presented findings (1.8MB pdf) on the behaviour of high burn-up fuel. They say that fuels with a burn-up above 45 GWd/tU cause previously unforeseen safety problems, and would break existing NRC safety rules (120kb pdf) unless changes are made to the way fuel elements are packaged. The danger would come if there were a sudden loss of cooling water - as in the accident that led to the partial meltdown of a reactor core at Three Mile Island, Pennsylvania, in 1979. To contain the radioactivity in such an event, it is crucial that the fuel rods and their zirconium alloy cladding maintain their integrity as they are doused with cold water from the emergency cooling system. If the cladding has become brittle, the rods may split open and leak plutonium and other radioactive material into the reactor building. Even during normal operation, cooling water corrodes the surface of the cladding by reacting with zirconium to form zirconium oxide. The NRC's rules require that the corroded layer must not amount to more than 17 per cent of the thickness of the cladding. Billone and colleagues say that where high burn-up fuels are used, this rule is not stringent enough. When they put different types of cladding used for fuel with a burn-up above 45 GWd/tU through a series of tests designed to simulate a loss-of-coolant incident, they found they all became brittle before oxidation had reached the 17 per cent limit. They attribute this enhanced brittleness to the increased amounts of hydrogen released by high burn-up fuels during normal reactor operation. The gas is gradually absorbed into the cladding, where it increases the solubility of oxygen. Between 650 °C and 1200 °C, this can trigger "breakaway oxidation" of zirconium, making it rapidly more brittle in an emergency. Fuels operating at 60 GWd/tU would produce around 40 per cent more hydrogen than existing high burn-up fuels. Edwin Lyman of the Union of Concerned Scientists (UCS) in Washington DC warns that the problems need to be solved long before the new reactors are switched on. "One can encounter unpleasant surprises even when dealing with materials and processes that are believed to be well-understood," he says. The Electric Power Research Institute, which represents US electricity producers, insists there is no imminent safety issue, and that modern reactors are operated in a way that ensures there will never be a catastrophic loss of coolant. Reactor materials expert Arthur Motta at Pennsylvania State University in University Park says it should be possible to solve the problems raised by Billone with new alloy types. "We should be able to safely increase burn-up." Despite these reassurances, the NRC, which commissioned the Argonne research, has launched a three-year consultation with a view to tightening up the rules. "We are actively preparing to revise NRC's safety criteria to account for the burn-up effect," Ralph Meyer of the NRC told New Scientist. "Interim measures have already been taken." Questions also surround how the waste created by high burn-up fuel will be disposed of. Irradiating uranium for longer in a reactor makes it much more radioactive, and decay of this extra radioactivity generates correspondingly more heat when waste fuel is stored after being removed from the reactor. According to Nirex, which until 2006 was responsible for dealing with the UK's nuclear waste, fuel with a burn-up of 55 GWd/tU irradiated in a pressurised water reactor would be around 50 per cent more radioactive than low burn-up fuel of 33 GWd/tU throughout the time it needs to be stored. To ensure that the build-up of heat is kept within safe limits, spent elements of the higher burn-up fuel will have to be stored further apart. Failure to allow for this would lead to a build-up of heat that could cause fractures in the containers in an underground storage site or in the surrounding rock, and so increase the risk of a leak. Though the increased efficiency of high burn-up fuel means there would be less of it, more storage space will still be required overall. In the UK, this may mean that the government will need to find two underground repositories, instead of the one now envisaged, says Hugh Richards of the Nuclear Consultation Working Group, a group of activists and academics opposed to nuclear power. This week, Richards published a report on high-burn fuels containing estimates from the UK Nuclear Decommissioning Authority (NDA) of the waste radioactivity that will be generated by the 10 planned AP1000 reactors. The figures, obtained under freedom of information laws, show that the peak level of radioactivity of the combined waste from the 10 new reactors, which is expected to occur in 2080, will be twice that of the peak level of radioactivity from all the UK's existing reactor waste - expected in 2020 (see table below). The NDA accepts that the enhanced radioactivity of new reactor waste could require "increased spacing" in a repository, but it disputes the need for fundamental design changes. The disposal of waste is being addressed by the design assessments of new reactors currently being conducted by regulators, the NDA says. Marion Hill, a radioactive waste consultant and member of the UK government's Committee on Radioactive Waste Management (CoRWM), says it is too early to know whether this will pose a big problem for the NDA. However, Pete Wilkinson, a nuclear consultant who was formerly a member of CoRWM, is already predicting some problems. "It will push up the size and costs of any waste repository and presents yet more technical uncertainties and ethical imponderables," he says. The report by Hugh Richards is available here (168kb pdf).